Availability ensures that service has little downtime and rapid service recovery. Reliability is availability for an agreed period without interruption. It aims to prevent downtime through reliable components, resiliency or the ability to continue operation despite failure of one or more components and preventive maintenance. 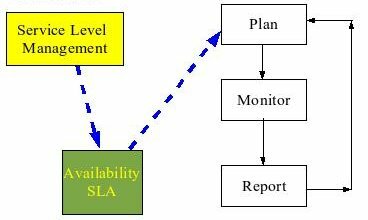 Availability service levels are used from Service Level Management. Planning determines the availability requirements. It also includes designing for availability and recoverability. Mean time to repair (MTTR) which is the measure of time when service is not available to the time service becomes available. It is referred as downtime. Mean time between failure (MTBF) refers to the time when the service is available. It is also referred as uptime. Reporting provides reports on availability (MTTR, MTBF, MTBSI), overall uptime and downtime, number of faults and other information on why the availability SLA was not met.